The HP 530M is a 2-port 10GbE Mezzanine adapter, featuring the next generation of 10Gb Ethernet offering in a single chip solution on a mezzanine form factor that further reduces power requirements for 2 ports of 10Gb Ethernet. It is designed for use with HP BladeSystem c-Class Gen8 blade server platform's type A and Type B mezzanine slots. 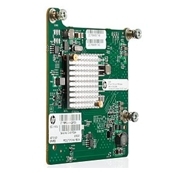 It provides full duplex high performance Ethernet connectivity with support for HP Virtual Connect Flex-10 blade interconnect technology, allowing each 10GbE port to be divided into four physical NICs and optimize bandwidth management for virtualized servers. The HP Flex-10 530M adapter, in conjunction with HP Virtual Connect Flex-10 technology, helps to extend the benefits of virtualization beyond the server and into the rest of the infrastructure. The HP 530M supports enterprise class features such as VLAN tagging, adaptive interrupt coalescing, MSI-X, NIC teaming (bonding), Receive Side Scaling (RSS), jumbo frames and PXE boot. It also supports virtualization features such as SR-IOV (Windows), VMware NetQueue and Microsoft VMQ.